Thomas "Hitman" Hearns was born on October 18, 1958 and is a legendary boxer who won eight world titles in six different weight divisions. Nicknamed the "Motor City Cobra" and more famously "Hitman", Hearns became the first boxer in history to win world titles in four divisions, then become the first fighter in history to win 5 world titles in 5 divisions. Hearns became the first fighter in history to win 5 world titles in 5 different divisions. He was named Ring Magazine fighter of the year in 1980 and 1984 and has battled with top fights over the years including Sugar Ray Leonard, Marvin Hagler and Roberto Duran. 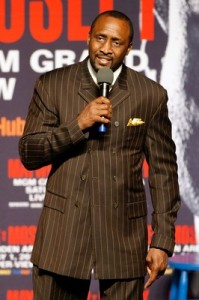 Inquire out Thomas Hearns speaker fees, locate Thomas Hearns agent, view upcoming Thomas Hearns speaking engagements, read about Thomas Hearns endorsements and booking Thomas Hearns autograph signings on his official website.